Access: Web, CD-ROM, and "U:\Geodata\Canada\Canada_sets\CanParks\"
Access: Web CD-ROM and "U:\Geodata\Canada\Canada_sets\CanParks\"
"CanMap� Parks V1.0 represents 1,254 national, marine, provincial and territorial parks across Canada, and is a combination of attributed boundary and point features. This nationwide mapping data product is ideal for consumer navigation and recreational GPS products, travel and tourism Web applications, infrastructure analysis and planning, wildlife and environmental risk studies, and much more. Nationwide Features Include: CanMap Parks comes with a free Canada Directory that includes Area Code Boundaries, Time Zones, Provinces, Regional Municipalities, and DMTI Spatial Urban Areas, in addition to a coarse water layer. This allows you to understand where the parks fall within Canada. Other features include. * 1,254 national, marine, provincial and territorial parks across Canada * National and provincial park boundaries and points * Name, type and park designation (wilderness, recreation, historic etc.) * Name of province and abbreviation code (alpha) * 1996 population, density and dwelling counts"
CanMap Rail is Canada�s only 1:50,000 scale precision-based railroad network mapping data. Built with the same quality and precision of CanMap, CanMap Rail provides the complete picture of Canada�s rail infrastructure currently in operation, including railway lines classified as abandoned. 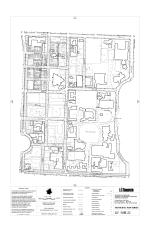 Clipped from CanMap Route Logistics Ontario v2009.4 by University of Toronto at Mississauga Library staff. Clipped from CanMap Route Logistics Ontario 7.2 by University of Toronto at Mississauga Library staff. Only road layer available, please contact the email address above for access to other layers. Only road layer ONrte available at this time, please contact the email address above for access to other layers. Not all layers available at this time. Please contact the email address above for access to the other layers. The Information Technology Branch staff have been working with various schools in the area, ranging from elementary schools to universities, in promoting the use of Geographic Information Systems in the classroom. In order to facilitate this exercise we developed a CD-Rom GIS data viewer package. The package is now available to the public for general purpose use. We would like to stress that the tool and data package was created for educational use and is provided "as is". For reprojection, here are some important notes: For the most accurate datum transformation, use the NTv2 grid shift files distributed by NRCan (they are included with some commercial software packages such as FME and the Data Interoperabilty Extension in ArcToolboxes. As well, you cannot perform a transformation directly from NAD27 to WGS84, you need to go to NAD83 first. --> from S.W. City of Toronto's Geospatial Competency Centre. Land use can be found in the Municipal Address Points layer. Shows additions from 1893 to 1914; place names. The Ontario Streets CD-ROM is a comprehensive mapping program that gives the user great versatility in finding streets and services information anywhere in Ontario. The extensive data base containing the locations of specific streets, public services, schools, and entertainment facilities enables the user to find specific places and plan a travel agenda. There is a detailed map of downtown Toronto, including the underground pedestrian/shopping system. Also, included is a GO Transit system map and a TTC Subway map. Maps may be custom edited, with symbols or points of interest. It is possible to determine distances and determine travel routes by drawing on the map from the point of departure to the final destination. The toolbar makes interaction with the maps easy, allowing the user to query the database, highlight points of interest, measure distances, navigate around the current map and more. A locator map window provides a small scale view of the area being studied. Note that some layers are free to download. Others must be requested through the map library. Contact us via the email address above. all roads can be found for public use here. If a layer you wish to use is not set up for download, please contact the email above for access. "A Significant Ecological Area is a polygon feature that identifies an area of interest to the Ministry that is ecologically significant, and warrants special consideration, excluding ANSI's, wetlands, parks, reserves or ESA's. Different Significant Ecological Area types collected by the Natural Resources Values Information System (NRVIS) include... - Designated Old Growth Forest - No-Cut Area - Significant Valley - Significant Woodland - Wetland, Unevaluated"
TCL Asset includes: 1. Geographic linear representation of transportation corridors, administrative boundaries and shorelines. 2. Geographic point representations of properties and municipal addresses. 3. Various administration areas of city interest. 4. Information linked to transportation corridors, addresses and administration areas. TCL stores linear features representing transportation corridors and boundaries, address points representing properties, doorways, sites, intersection features and area features. All features are attributed with feature codes, with the date they were entered into the asset and the date they were removed from the current asset to the archival asset, with identification numbers unique over time and in the city and with name, lineage and accuracy information. In addition to retaining historical archives, threaded archives are also retained that record splits and merges of address points, of linear features and of area features. All features are linked and integrated. Supports all city operational and planning programs. Examples include Emergency (911) dispatch, city permits, welfare case management, boundary administration area re-alignments, waste collection, traffic control and electoral functions. Requests must be made to map library staff at above email address and a licence agreement signed. Combines topography and parcel mapping. The series provides a base for thematic mapping services and other published hardcopy products. Depicts the following features: building envelopes building outlines railway lines major watercourses municipal addresses curbs park names street names property lines right of way boundaries etc.